Old-fashioned recipes for hermits often produce rock-hard cookies peppered with bland, tough raisins. We wanted a moist, chewy cookie, gently redolent of molasses and warm spices. Traditional recipes for hermits call for creaming the butter, but this produces a dry, biscuit-like cookie. Melting the butter and then cooking it until it browns delivers a chewier, moister cookie, with a nutty flavor. Adding cinnamon, allspice, and ginger to the browned butter blooms their natural flavor, which allows us to use a smaller quantity of each for gently spiced cookies that aren’t dusty-tasting like so many old-fashioned versions. Hermits are typically studded with raisins, but those raisins can often bake up hard and chewy. For rich raisin flavor in every bite, we puree them with chopped crystallized ginger and then combine the mixture with the melted butter to soften the raisins. 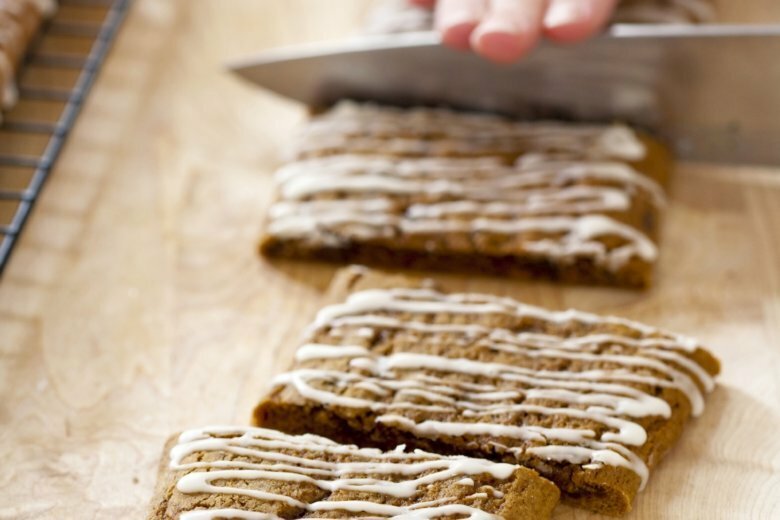 This helps distribute raisin flavor throughout the cookies, while the pureed ginger lends pungent sweetness and chew. For this recipe, we prefer using mild (or light) molasses instead of the robust or blackstrap varieties. Adjust oven racks to upper-middle and lower-middle positions and heat oven to 350 F. Line two baking sheets with parchment paper. Process raisins and ginger in food processor until mixture sticks together and only small pieces remain, about 10 seconds. Transfer mixture to large bowl. Heat butter in small saucepan over medium-low heat, swirling pan occasionally, until nutty brown in color, about 10 minutes. Stir in cinnamon and allspice and cook until fragrant, about 15 seconds. Stir butter mixture into raisin mixture until well combined; let cool to room temperature. Combine flour, baking soda, and salt in bowl. Stir brown sugar, molasses, and eggs into cooled butter-raisin mixture until incorporated. Fold in flour mixture (dough will be very sticky) and refrigerate, covered, until firm, at least 1 1/2 hours or up to 24 hours. Divide dough into quarters. Transfer 1 piece of dough to lightly floured surface and roll into 10-inch log. Transfer to prepared sheet and use ruler to neatly square off sides. (Each sheet will contain 2 logs.) Repeat with remaining dough. Bake until only shallow indentation remains on edges when touched (center will appear slightly soft), 15 to 20 minutes, switching and rotating sheets halfway through baking. Let logs cool on baking sheets for 5 minutes; transfer parchment to wire racks and let cool completely. Whisk orange juice and confectioners’ sugar in small bowl until smooth. Drizzle glaze onto cooled logs and let sit until glaze hardens, about 15 minutes. Cut logs into 2-inch bars and serve. Nutrition information per serving: 212 calories; 51 calories from fat; 6 g fat (3 g saturated; 0 g trans fats); 37 mg cholesterol; 113 mg sodium; 38 g carbohydrate; 1 g fiber; 27 g sugar; 2 g protein.